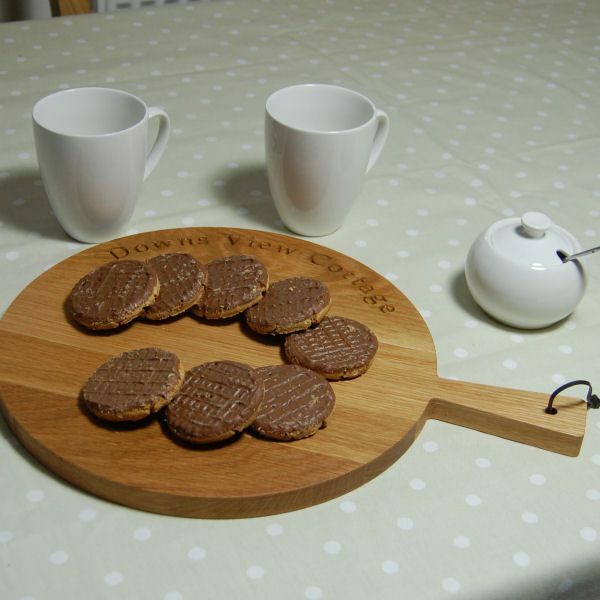 These circular wooden paddle serving boards are skilfully hand crafted from prime European oak using full-length staves which provide hard wearing and highly tactile boards. This round wooden serving paddle is an ideal way to display and serve all your favourite foods, albeit with a rustic twist – guaranteed to impress your guests. 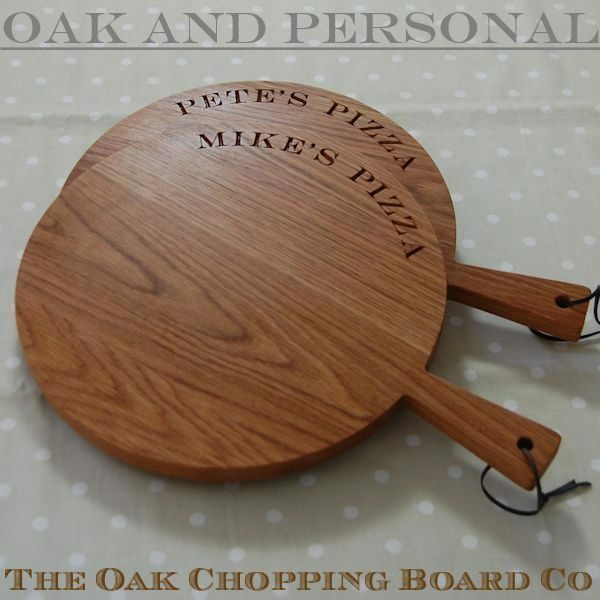 Although specifically designed for serving, our wooden paddle boards may also be used for chopping tasks, cheese, transferring pizzas to and from the oven, and many more vital jobs around the kitchen and dining table. 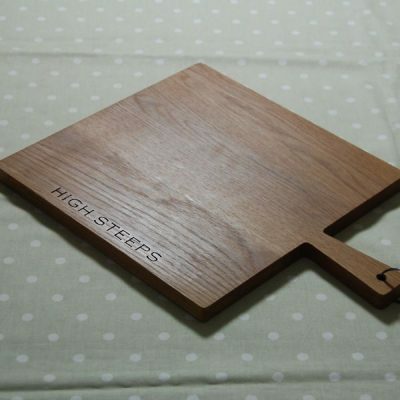 Each of these gorgeous boards is hand made by skilled craftsmen in our West Sussex workshop and incorporate an ergonomic handle for trouble-free transfer of food. 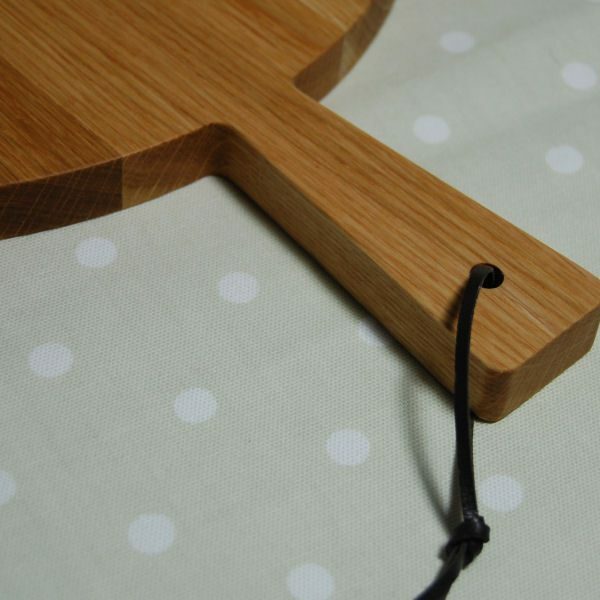 A real leather loop is let into the handle in order that the paddle board may be hung up when not in use, making an attractive addition to your kitchen décor. 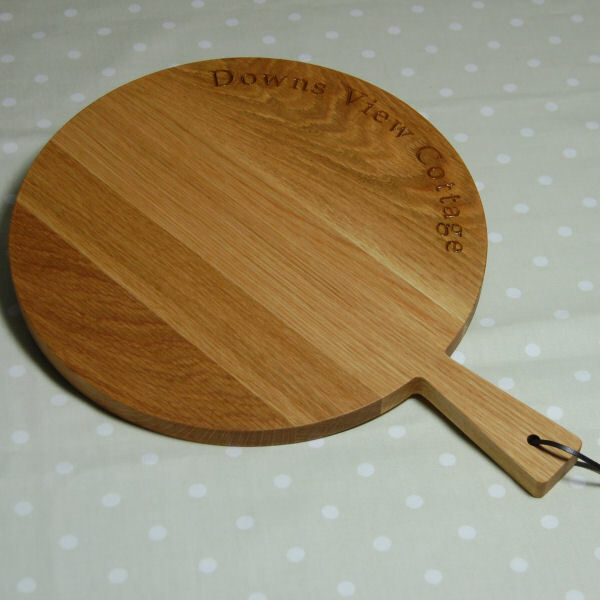 Our circular paddle servings boards are 30cm diameter (30x40cm including handle) and 1.8cm thick. 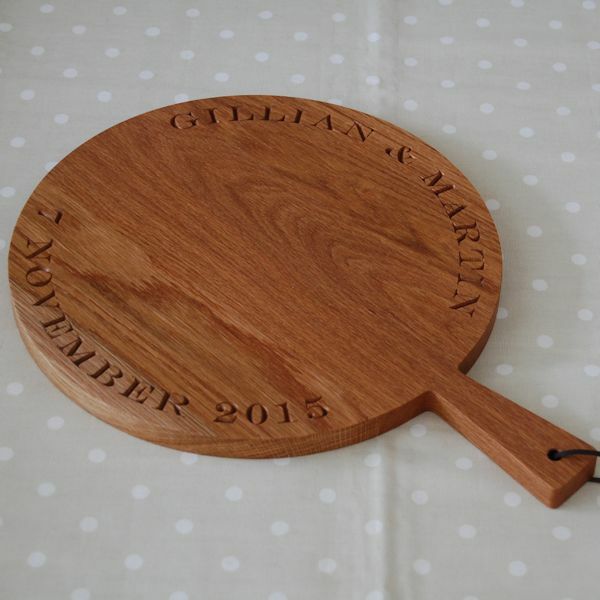 For a truly unique gift our handcrafted oak paddle boards may be personalised with your own message or a design from our range of 2D and 3D motifs. We can also create your own unique personalised cipher or motif design of your own. Your beautiful paddle serving board will be finished with ultra-fine sandpaper providing a near-polished finish, followed by a comprehensive treatment of a blend of natural oils and waxes before it leaves our workshop. The finish primarily contains food-grade white mineral oil and beeswax, and along with other natural oils and waxes, provides solvent-free, 100% food-safe protection. 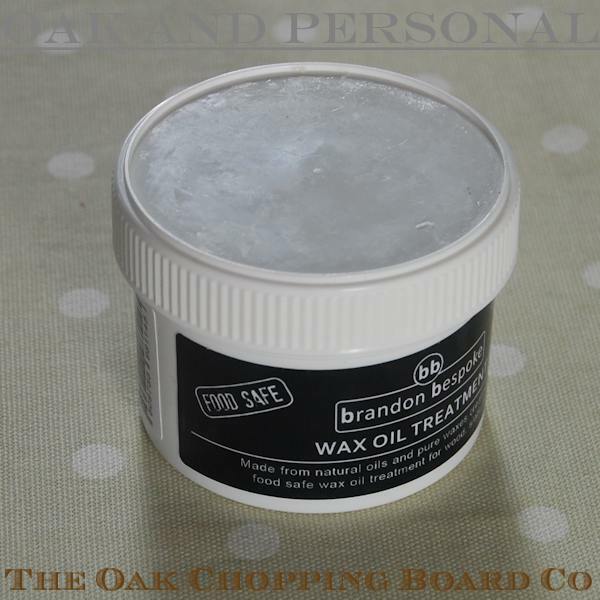 To maintain the beauty and durability of your serving board we recommend it be periodically treated with Brandon Bespoke Wax Oil Treatment, or a similar product. A tight turn around time was accommodated with friendliness and everything possible was done to ensure that we received the perfect wedding gift for our friends. 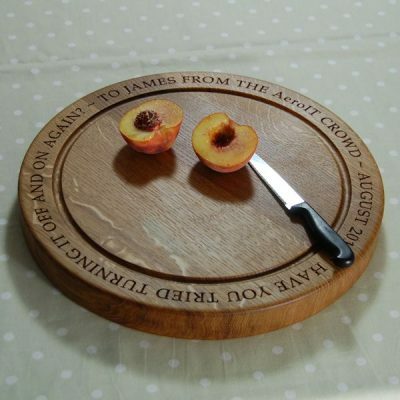 It was something I was delighted to give and the recipients were thrilled by it. 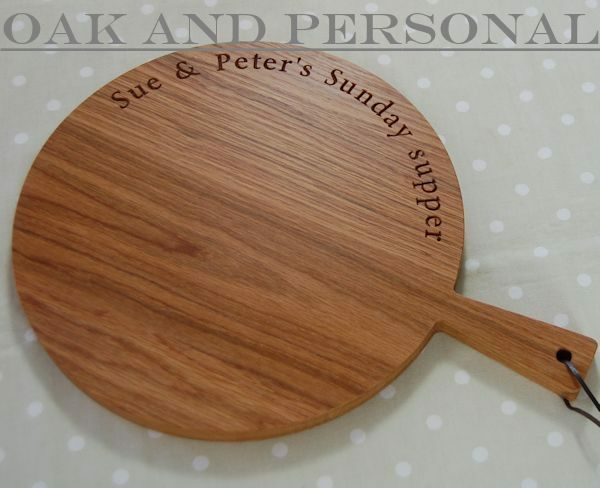 After purchasing one if these serving paddles for my friend, I decided to buy one for myself. Once again, top quality and unique product. Thank you John and Diana for a great service. 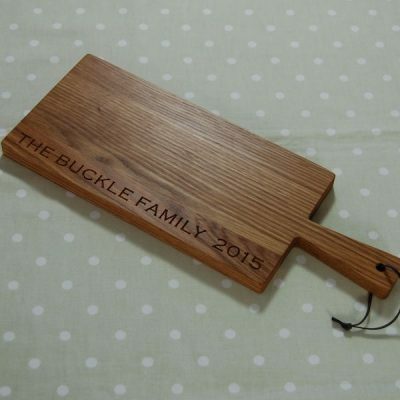 A truly unique gift and so personal to the recipients – lovely craftsmanship. Will definitely be ordering again. Thank you.